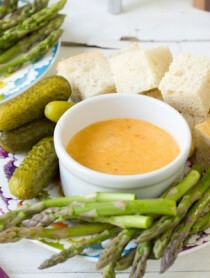 Fun, festive, and gluten free! 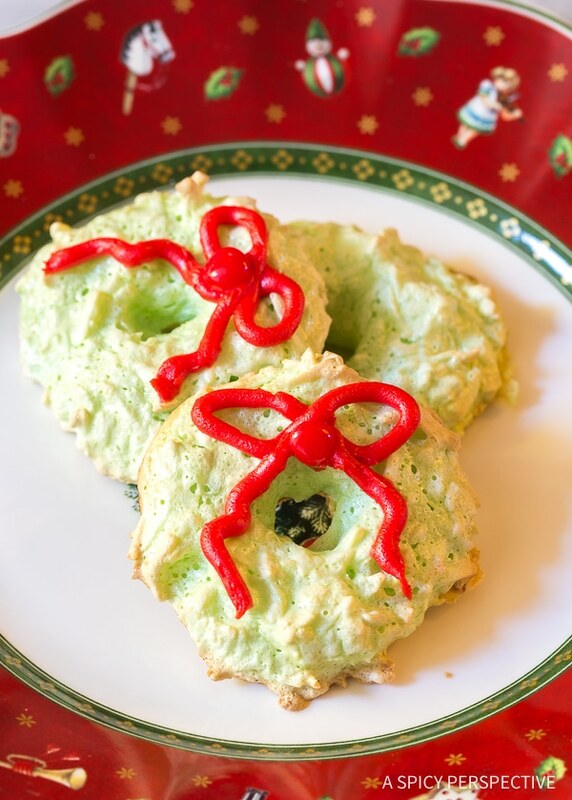 Our Christmas Wreath Coconut Macaroons cookies will make your holiday guests smile. 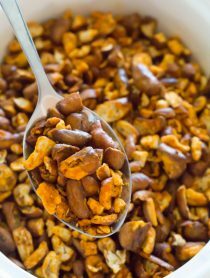 It can be hard to enjoy holiday parties when you have food allergies or dietary restrictions. I’ve watched many of our friends struggle with sensitivity to certain common ingredients, to the point where they now carry their own “safe” meals with them everywhere they go. Coconut macaroons have been one of my favorite cookies since childhood. I love how soft and chewy they are, with a huge pop of coconut flavor. 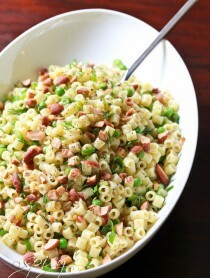 They are easy to make, yet taste luxurious. And best of all, coconut macaroons are naturally gluten free, grain free, nut free, and dairy free! We make simple coconut macaroons every year around the holidays. So this year I thought it would be exciting to dress them up for Christmas! 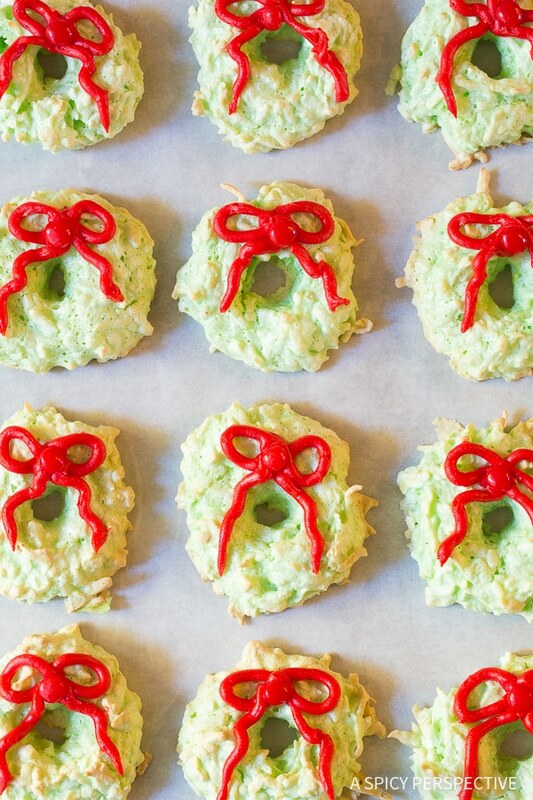 Our Christmas Wreath Coconut Macaroons are fun to bake and even more fun to eat. They look like little holly wreaths with a soft green hue. 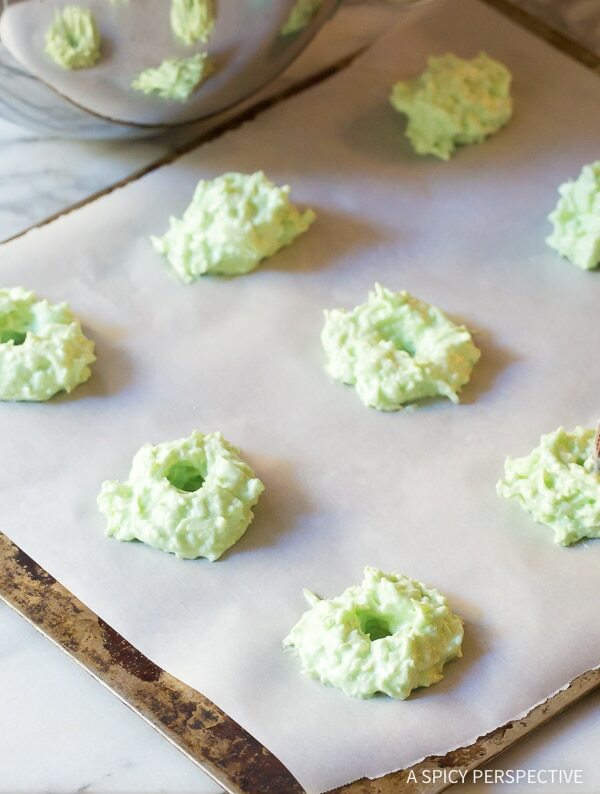 This Christmas Wreath Coconut Macaroons recipe varies slightly from my classic macaroon recipe, because the cookies need a little extra stabilization to hold the wreath shape. I simply dropped them onto the baking sheets with a cookie scoop, then used the blunt end of a chopstick to swirl a hole in the center. I used pre-made red decorating icing (you can find in the baking section at the grocery store) to pipe red bows on each cookie. Then pressed a red hot candy in the center as the knot. 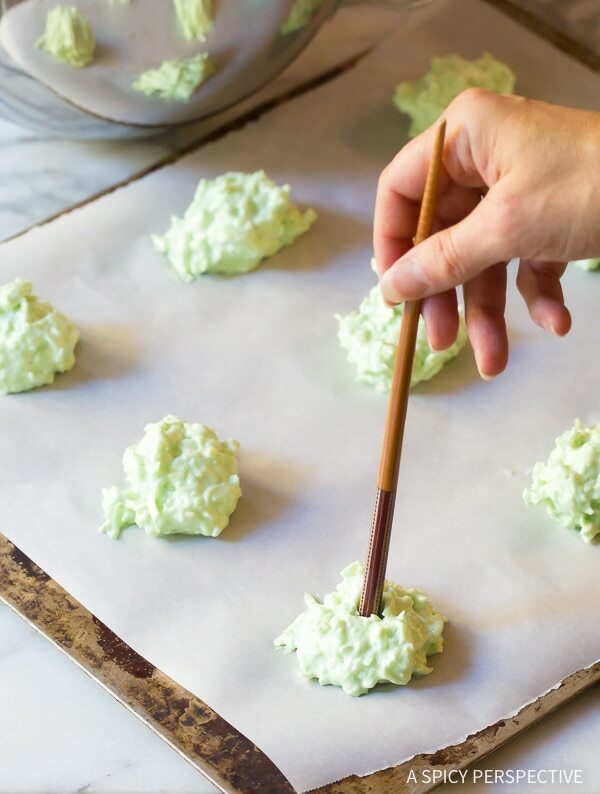 If you are sensitive to food coloring, you can find natural food coloring that is free of processed chemicals, then make your own simple frosting for the bows. 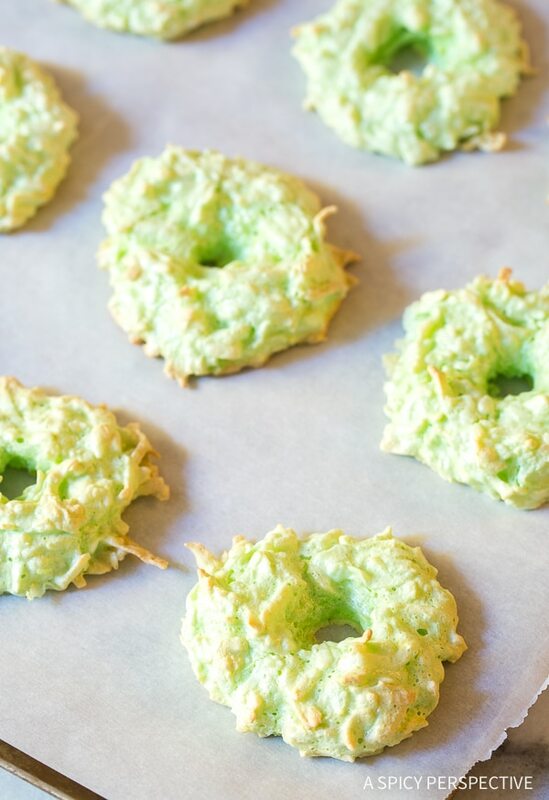 Hopefully these simple Christmas Wreath Coconut Macaroons will help make the holidays a little more jolly for everyone you love! 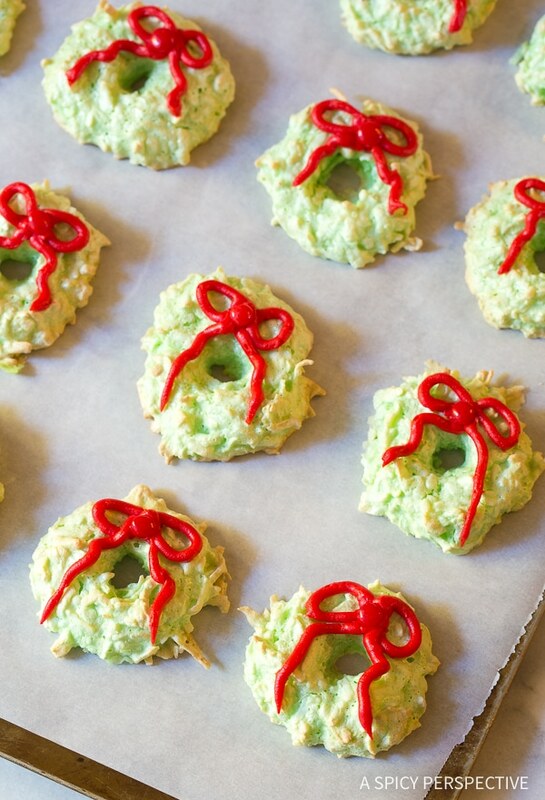 Try our easy festive Christmas Wreath Coconut Macaroons Recipe; it's gluten-free and grain free! These macaroons are soft, packed with coconut, and utterly delicious. Preheat the oven to 325 degrees F. Line two baking sheet with parchment paper. Separate the eggs, making sure no yolk drips into the whites. Place the egg whites in the bowl of an electric stand mixer. Add the sugar, vanilla, salt, and cream of tartar. Using a whisk attachment, whip the egg whites on high until a very firm meringue forms. 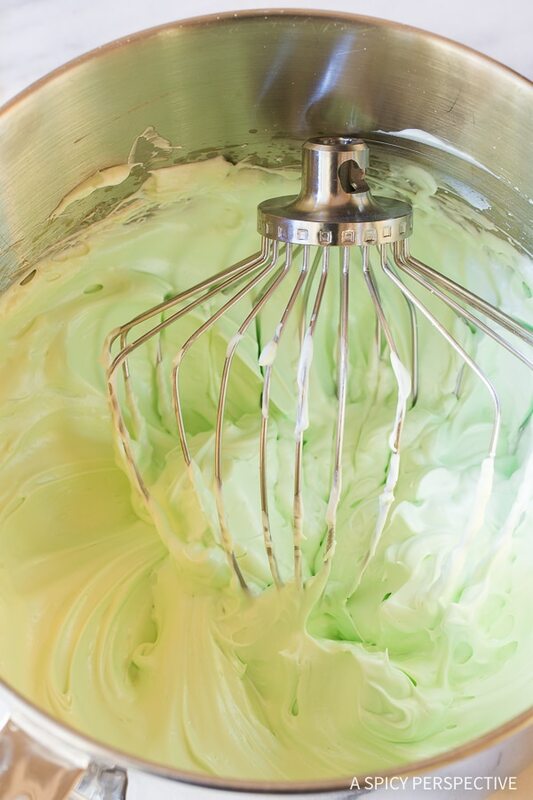 Turn the mixer on low and mix in the cornstarch and green food coloring. 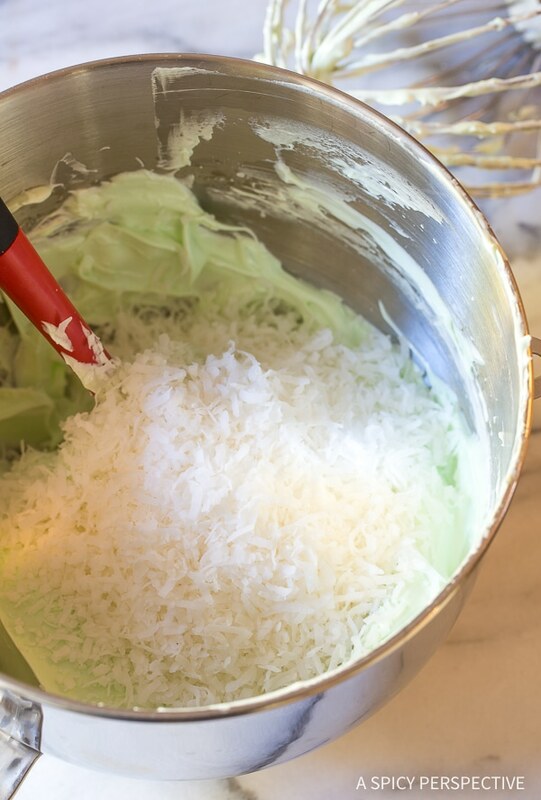 Then turn off the mixer and fold in the shredded coconut. Use a 1 1/2-tablespoons cookie scoop to portion out the cookies. Place them 2 inches apart on the baking sheets. Then use the wide end of a chopstick to swirl a hole in the middle of each mound, creating a wreath shape. Bake for 18-20 minutes until golden around the edges. Cool completely. Then peel the cookies off the paper before decorating. Use decorating icing to pipe a small bow at the top of each cookie. Press a red hot candy in the center of each bow, as the knot. Once the icing is dry, store in an airtight container, with parchment or wax paper between the layers, for up to a week at room temperature.